Before leaving Iceland, we still had one more road trip in store. Instead of flying from the East coast to Reykjavik, we decided to hire a car and drive there. There were many locations that Eb and I had wanted to see before we left. The locals say the drive can take 8 hours, but that’s with no stops. We planned to stretch the drive out for two days. Iceland has one main road that goes around the whole country called the Ring Road, which is the road we used to navigate our way to Reykjavik while also taking back streets to see what we could find. Our main plan was to hire a 4×4 car, stop halfway between Neskaupstadur and Reykjavik, somewhere near Vik so we could pull out the tent and camp, or if that wasn’t possible, sleep in the car. We bought groceries so we could use our camping stove rather than eating out since Iceland is so expensive. Our local friends at the hotel said that we shouldn’t camp, nor sleep in the car, because the temperatures can drop below zero and what not, but because we’re (me) quite stubborn and because we don’t want to spend x amount of money for just one night, we decided against that. We had a bit of an emotional goodbye on our last night to our Hildibrand fam who made our 3 month stay unforgettable. We’ll miss all of those people very much and we hope to see them all again. We set off the next morning before sunlight and had a sad little drive as we were leaving Neskaupstadur. Our car was jam packed with our bikes in the back along with the bags, food and tent. As sad as we were, we were so excited to see more landscapes of Iceland. Instead of taking the ring road straight away, our Icelandic fam told us to go through the East fjords as it wold have better scenery rather than taking the ring road straight away. How’s the bloody serenity!? My goodness! We were so glad that they told us to go through the East Fjords (shout out to Gudni, Hronn and Laufey), these landscapes were incredible. We were so happy to see the ocean with the sun. We stopped many times just to hop out and take a walk. 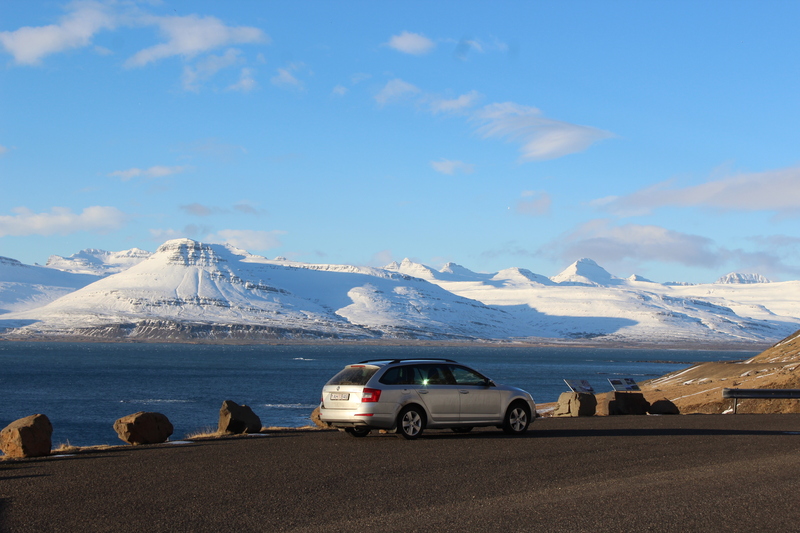 It felt like we had these mountains all to ourselves as we’d only passed 3 cars while driving through the East fjords. This next destination was the first place that Eb and I had on our list, it’s called Stokksnes. You wouldn’t actually know about this spot unless you researched it. A place that can easily be by passed, as it’s off the Ring road and the road you take to get there looks like you’re driving to nowhere until you get to the end. It was so nice and quiet out there. We had it all to ourselves which was really cool. Our next destination we had on our list was Jokulsarlon Ice Beach and Glacier Lagoon. Imagine a beach with black sand and icebergs. Well, we went there. It was so cool to see it in person. The reason this beach has icebergs in it is because of the glacier lagoon not far from it. Ice breaks away from Breidamerkurjokull glacier which ends up in Jokulsarlon which then ends up in the ocean. This place was unbelievable. It felt as if we were in Antarctica. So many broken bits of ice in crystal clear water. The lagoon covers an area of 18 km2 and is the deepest lake in Iceland at over 248 meters. Because this is a main attraction in Iceland it was stacked full of tourists which always dampens the mood. We walked down further where we had this little area all to ourselves, or so we thought, we were lucky to have a family of seals chilling out right in front of us! One thing we learned from the locals is that Iceland have many problems with tourists who don’t necessarily respect the land or are too naive. The week before we arrived to Jokulsarlon, tourists had to be rescued as they stupidly went walking on the icebergs. The icebergs broke away and started drifting out to sea. Icelanders really dislike tourists who don’t respect the land and go about thinking everything is fine (I guess like how we are choosing to sleep in the car, but that’s different :)). Mainly because the rescuers are volunteers and the equipment they use costs a lot of money. Before arriving to Jokulsarlon I was planning on doing another polar plunge. I asked the locals I worked with and they said it could be dangerous and that maybe I shouldn’t. As much as I wanted to do it, I decided not to, just because if something went wrong, I didn’t want to be “that guy”. We were disappointed as there were two locations (Svartifoss waterfall and Fjadragljufur canyon) that we didn’t get to see due to the roads being closed because they were too icy and dangerous. At least that’s what the sign said that covered the roads. The sun was setting quickly as we were approaching the halfway mark, Vik beach. We had found websites online that say it’s illegal to wild camp and then we found other websites that said it should be fine. We decided to camp as long as we just leave early in the morning and clean up after ourselves. We were scouting for a place to camp as the sun fell but as weird as it sounds, it was hard to find a place to set up camp. We didn’t know if the land we were on was private land, plus the grounds everywhere were uneven, or covered in snow. It was ridiculously cold outside of the car. We decided to scrap that idea and just sleep in the car. I thought it’d be sweet if we just parked the car at Vik beach parking lot, but there were signs saying no sleeping! It was now pitch black and absolutely freezing. We kept driving on the Ring Road when I saw a little rest parking lot on the side of the road. I saw a hired camper car there and thought we might as well just pull in here and call it a night. When we went grocery shopping, we bought 6 cans of spaghetti bolognese with a loaf of bread for dinner. We were so hungry so we set up our camp stove right away. As Eb was pouring the cans into the pot I noticed it was just sauce spilling out, no spaghetti! Eb and I both looked at each other and couldn’t believe it. We had a closer inspection at the can and saw that the label just said ‘pasta sauce’! It had a picture with spaghetti and everything so we thought it must have been inside too. It was such a disappointment! We were absolutely starving! We had bought 4 more of these cans to last us the next couple of nights. You might think, why not just go to the nearest grocery store or petrol station. The problem was, it was late at night and everything was closed or too far away from where we were. We were literally in the middle of nowhere. The only other food we had was a loaf of bread, with peanut butter. We cooked the sauce anyway and just dipped the bread in. It was horrible and didn’t satisfy us at all! We threw out the sauce and just ate bread for dinner. After our awesome dinner, we were absolutely knackered. I took out our bikes from the back and put them outside so we could lay the back seats down to have a more comfortable sleep. It was a very cold night but it was calm with no wind and the sky was lit up with the most stars I’ve ever seen. I was banking on the Northern lights to happen for us, no dice. We pulled out the sleeping bags which are -5 degrees Celsius and put on some warm clothes and went to sleep. I love the photos of the ice on the beach! Great blog and stunning photos! This has certainly got me excited for our trip in Sept. I think it is ok to wild camp as long as you are respectful and get permission from the land owners. That’s what we are planning on doing anyway. I really feel for you guys with the food situation! We’ve been there a few times, but never in those temps! Looking forward to reading part 2!